Designed for quick access to a student’s accommodation information, our Student Accommodations Folders are an easy-to-find canary yellow and contain accommodations that can be customized to each student. Since teachers are required to keep samples of the accommodated work, these folders are lifesavers for busy teachers who have multiple students with accommodations in their classrooms. 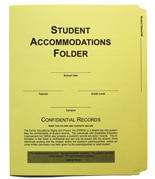 Order a sample of our Student Accommodations Folder! Send us an email! We will get a sample out to you right away.